Gil Geerings, who lives in Belgium, has always been a collector of World War II artifacts. In the summer of 2008, Gil and his friend Nicky decided to go on a metal detecting trip to the Huertgen Forest. Near the settlement of Gerstenhof, which is close to the town of Schmidt, they discovered four large dug-outs. They started to sweep them with the metal detector. When Gil received a very low signal, he put his shovel in the ground and out came this bracelet. Click here to view the exact finding spot on Google Maps. I found a William M. Howard, New Brighton, Beaver County, Pennsylvania. New Brighton is north-west of Pittsburg. He was in the Headquarters Company for the 2nd Battalion, 311th RCT. The 2/311 came through Woffelsbach to Schmidt, so that is the general area where you found the fox holes. I consider this enough verification to say he is your man. The 2/311 jumped off against Kesternich on the morning of January 30. It took three days for it to fight its way through the town. It was a terrific fight. The moved down off of the Kesternich plateau to the Roer (Rur) at Ruhrberg (4 February). At 0300 on the morning of 5 February they moved out on the attack toward Woffelsbach where they ran into some pill boxes. On the 6th they consolidated their position at Woffelsbach. On 7 February the 2/311 on the right jumping-off from Woffelsbach and the 3/311 on the left jumping-off from Hechelschied moving on Schmidt. The 2/311 moved parallel to the Rursee. The terrain was difficult and the 2/311 had to handle a number of German 88mm, 75mm and mortar positions. The two battalions captured nearly 200 German Soldaten for their day's effort. At that point, on 8 February, the 1/311 and 2/311 were attached to the 9th Infantry Division in a meddling affair by the Corps commander that effectively took them out of the fight. The involvement of the 9th Division was supposed to assist the attack, but instead slowed the entire 78th Division attack by one day. So, I assume Howard lost his ID bracelet sometime on 6 or 7 February. More likely 7 February. No doubt, since they were consolidating their position, there are other fox holes nearby. His enlistment data (the link you gave) is interesting since it indicates that he was in a "Reserve" unit prior to his enlistment. Normally someone coming from the reserves into a unit would be at such a low rank as Pfc. I'm guessing he was an ASTP (Army Specialized Training Program) guy, The ASTP program was a program where the Army put guys in to college for training as officers and technical training. So these guys attended college. They were 18 and 19 years old. Just before the time that the 78th Division was shipped overseas its ranks were filled with ASTP students who's dreams of going to college on the Army's cost while staying out of the war were shattered and they found themselves with the rank of Pvt and Pfc in infantry units. They were pushed into units with little or no infantry training. Don't let anyone tell you that the Germans were the only ones who were pushing young guys to the front without training. At this time in the war the Americans were doing it too. I did a Social Security Death Benefit search on William M. Howard and didn't find on who's Social Security Card was issued in Pennsylvania. So that would indicated he might be alive today. However I couldn't find an address for a William (or Bill) Howard in that area of Pennsylvania. If he is still alive, he might have moved. 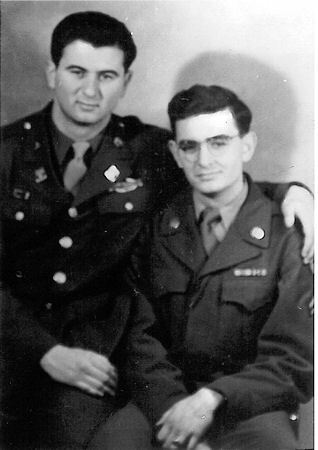 I am trying to contact a veteran of the 78th who lives in the area to see if he ever knew him. I found one person with the name Howard who lives in New Brighton and four people with the name Howard who live nearby New Brighton at a town called Beaver. You might consider writing these folks. Wait till I hear from this one veteran before you write. Next thing, Gil wrote the Beaver County Genealogy & History Center and they found that William Howard had passed away in 1984, but his brother Paul was still alive. 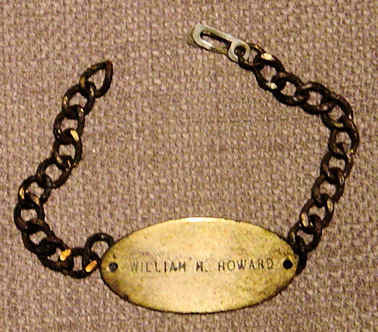 The bracelet was sent to him and he gave it to Marianne Howard the only child of William. Marianne plans to give the bracelet to her mother. 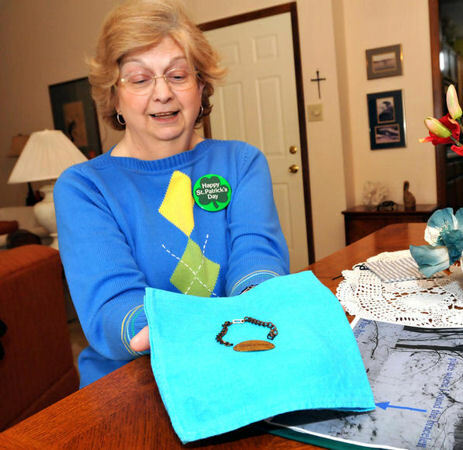 The bracelet was buried for 63 years and the family is amazed to have received it back. 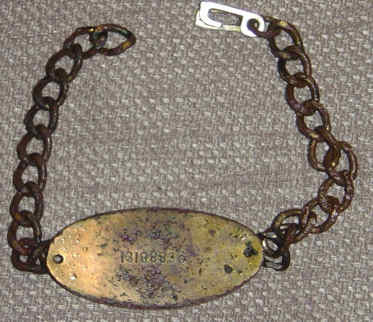 Marianne Howard's father wore this ID bracelet when he served in the Army in Europe during World War II. Bill stayed in the Army after the war and made a career out of it. He served in many locations around the world and then retired after completing the required number of years. Did many things after retiring; sold insurance, was a prison guard, did telephone collection, etc He and Rose had a beautiful home in Columbia, South Carolina...she still lives there. Bill died in 1984. They have one daughter---Marianne---who lives in Fayetteville, North Carolina. In the Huertgen Forest, Gil and his friend also found a U.S. Army 1 Qt. Canteen with the name TOMMIE WILLIAMS engraved on it, and are trying to find out more information about this soldier.